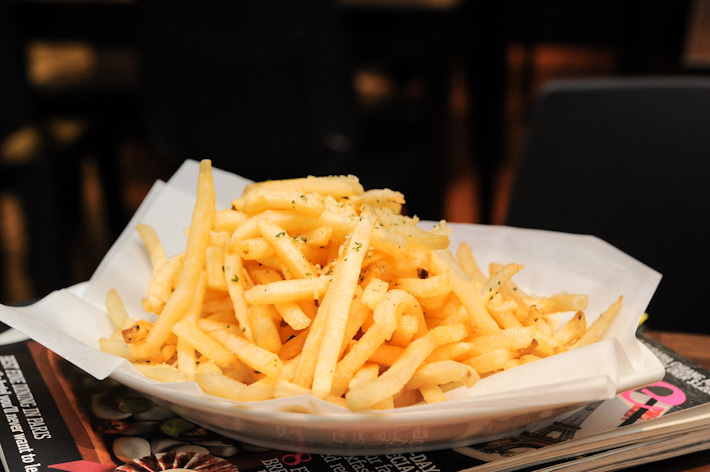 This guide to the best truffle fries in Singapore was last updated on 22 Feb 2015. 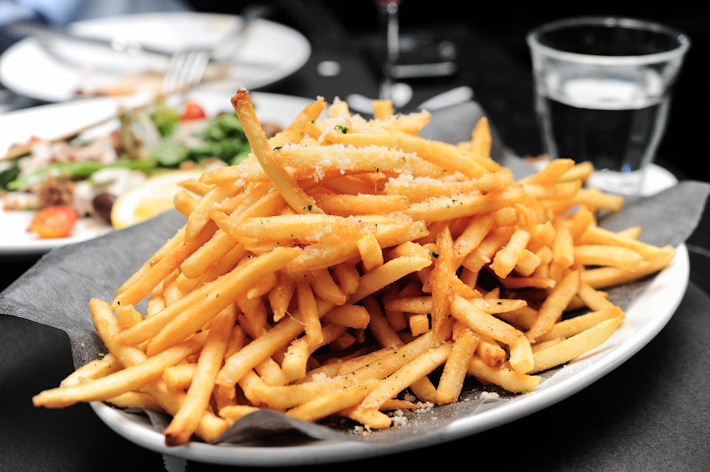 Truffle fries are French fries tossed with truffle oil, truffle salt and parmesan cheese. Truffle oil is used to impart the earthy flavour and aroma of truffles to fries; giving it a strong smoky after-taste. It is not hard to understand why people crave for it. There is just something appealing about the exotic truffle oil – you either love it or hate it. Here is a list of the best truffle fries in Singapore. Dancing Crab is a new dining concept by the Tung Lok Group at the Grandstand. The whole idea is that you eat seafood directly from the table with your bare hands – of course, you can use utensils or eat from the plates, but we won’t encourage that because it takes the fun away. The restaurant offers a side of Spicy Cajun Fries (S$7) to go along with the classic seafood dishes like Fish & Chips, and Lobster Roll. But we highly recommend getting the Truffle Fries (S$7). Habitat Coffee at Upper Thomson Road deserves a mention for the great work that it has been doing. The bistro has been around for a few years, and despite the tough competition, it shines and remains a favourite for many. The menu has a nice mix of sandwiches, brunch food, pasta, and desserts, but you must start with the Truffle Fries (S$8). 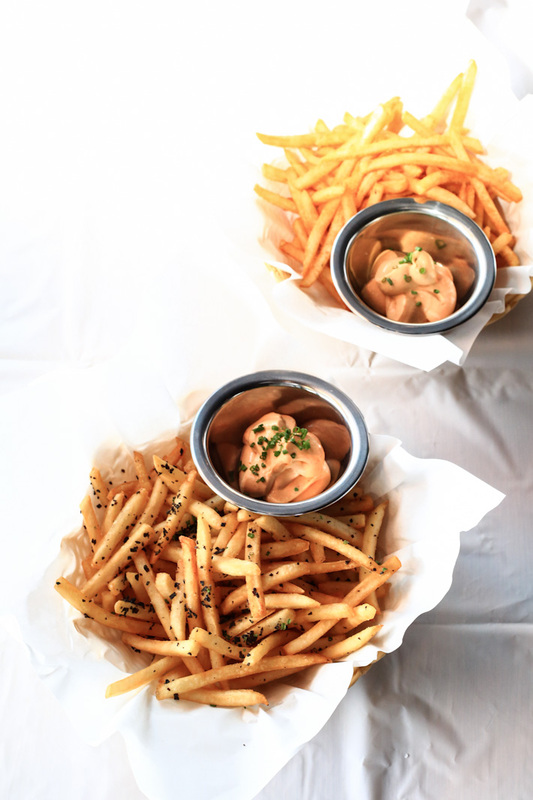 When asked about the best truffle fries in Singapore, most people would immediately think of House at Dempsey Hill. The Truffle Fries here are deep-fried to a shade of gorgeous golden-brown, and infused with quality white truffle oil. One of the most stylish rooftop bars in Singapore, Lantern at The Fullerton Bay Hotel has a great view overlooking the Marina Bay waterfront – it is the go to place to bring visitors for a drink. Be sure to order the to-die-for truffle fries. PS Cafe makes you feel cool just by dining there, and this is why it has continuously shines amid the strong competition in the local food scene. It has a well-thought menu which features simple and comfort food that always hits the spot. Something that you must not miss when you are there is the much-lauded truffle fries ($15). 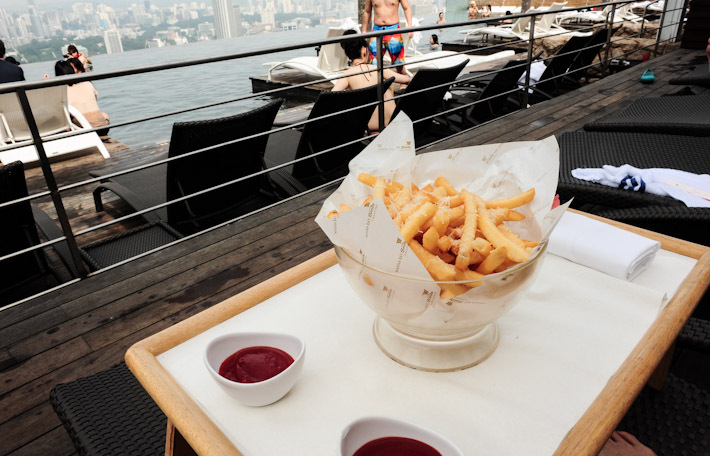 The truffle fries from Sands Skypark are not only addictive, but they also come with a million dollar view of Singapore’ skyline. With its al fresco area and a rooftop bar, Supply & Demand Modern Bistro & Rooftop Bar is a great place for a relaxing meal. They focus on Italian and South East Asian cuisines, and you may expect a combination of mouthwatering street food – from Malaysia, Indonesia, and Burma – presented in a modern way. For appetisers, go for its Garlic Truffle Fries (S$15). Cut into huge chunks, the fries are splattered with truffle oil and topped with shaved Parmesan and roasted garlic bits. They are good on its own, but if you want something more, dip it in the spicy homemade dip. 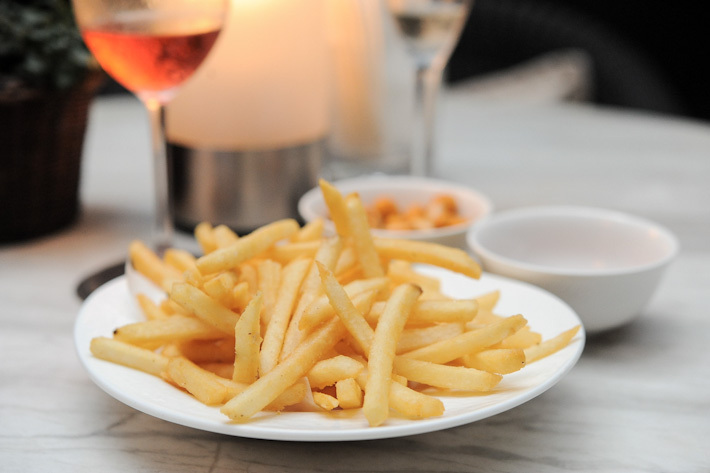 Who can resist the addictive thick cut of fries perfumed with earthy black truffle and parmesan from Tanjong Beach Club? On a weekend, nothing beats having Black Truffle Fries (S$15) and a delicious cocktail while lazing by the pool. The Coastal Settlement is a perfect place to chill out with loved ones and friends in a relaxed and fun setting. In particular, you must not miss their truffle fries. heya, long time no comment. i also surprisingly/randomly found nice truffle fries at raindrops cafe and acid bar!! @emily how have you been! yeah so many places are serving truffle fries nowadays. Will check them out too, thanks! So, the moral of the story is… Bring your own truffle oil and salt to Mac’s. Problem solved, and much cheaper too. I agree with Chicklet. It is vulgar to spend $11-15 on fried potato with a teaspoon of truffle oil. Great list! I would also add the Truffle Fries at Skinny Pizza on the list. It may not be as fancy, but the truffle aroma is very evident. @Arlene the truffles fries from Skinny Pizza are the same as the ones from Barracks Cafe. Truffle Fries at Kung Fu Paradise from the Paradise group are thicker than most which gives a different experience, but served in a really small portion. I absolutely love the truffle fries at PS cafe but the best I ever had was at Casa Tartufo at Forum Shopping Mall! The handcut fries are sweet, meaty, crispy and each strand perfumed with luscious truffle flavour! I totally fell in love with truffle fries as well after I tried them! I’ve had one at about $6 at Skinny Pizza at Wheelock (their pizzas are awesome too), and it’s a great additional to any meal! word about the MAcs Fries man!!! What do you think of the One Rochester Group’s truffle fries??? Best truffles fries ever? Jimmy Monkey’s! They’re actually wedges, not French fries, which is why I <3 them so much. tbh, the barracks is lacking in standard. Furthermore, at 11 bucks, its just overpriced. Agree that truffle fries are a bit over the top but hey, if you want a bargain while still being able to savour the delicate truffle fries, you should check out The Pizza Place at raffles city. $7 bucks. way cheaper and I think it’s a bigger portion. Try Fuse bar @ MBS truffle fries. its like Fries totally dipped into truffle oil! theres a western stall at a kopitiam in toa payoh that serves truffle fries for $3. definitely not the best around but its good! Au Chocolat at MBS serves nice truffle fries as well.. can also try the sweet potato fries with plum powder! 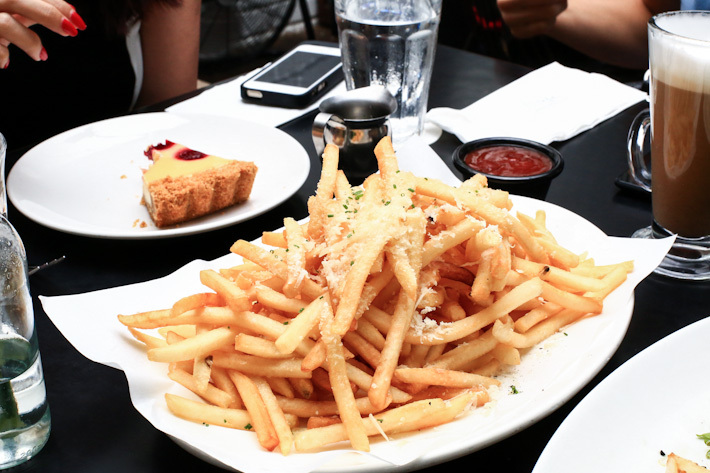 You need to try Alleybar/Acid Bar’s Truffle fries! &made’s truffle fries are pretty decent too! the dessert is to die for. Best I’ve tried was at a really small cafe called Chillax. I wonder if they are still around…. Try out the truffles fries at Salt & Grill at Ion. Hey. You might want to include the truffle fries at City Golf situated just below One Altitude. Intense truffle scents, super crunchy thick cut fries and the breath taking view take you as close to heaven as it gets. The truffle fries at Shaw Premiere (NEX) is really good too! Cost only $10 if I didn’t remember wrongly. Its at a quiet corner at Rangoon called JEWEL COFFEE . Their coffees fantastic too as they roast their own coffee beans. …must go try yourself. .. Au Chocolat at MBS has closed. You can remove the entry. Have you tried the truffle frites at Kith Cafe Park Mall? @Jon Yes I tried it before but wasn’t impressed by it. 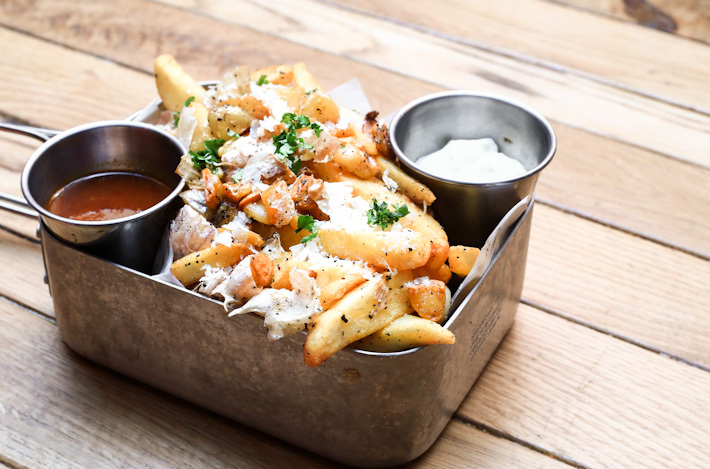 You should go try Platypus kitchen’s truffle fries. They’re to-die-for! I bet it’ll beat all the other restaurants hands down. They serve their truffle fries with thin (but not kiam siap) truffle slices and cheese shavings, not just the salt and oil. Oh man, and the price is sooooo affordable at $8.90. This restaurant is so under the radar, they really deserve more Customers, everything is so yummy and their pastas are Also handmade! Dont forget the duxton hotel , duxton cafe! Superb! I love Symmetry’s. Not on this list. =( And sorry Coastal Settlement, I prefer Symmetry’s to Coastal’s. I recommend Spize truffle fries @ River Valley. Crispy & Truffle is indulgence. Price below 10bucks. The best and cheapest is at The Pizza Place raffles city. The truffle aroma and flavor is top notch. Very generous with their truffle oil! Surprisingly truffles fries served at The Assembly Ground is one of the best I’ve ever tasted, on par with Supply and Demand! You need to try the truffle fries at Sprmrkt! It comes with kelp and parmesan….. you’re missing out! The truffle fries ($10) at the Barber shop at Old Parliament is super nice and fragrant! Comes with truffle mayo.